I thought I would put all the little tapestries I made at my artist-in-residence in one post. I have included links to prior posts at the end--some have more details about individual tapestries. I wove one of these each day. Most of them took about 3 hours to complete. All were 2 x 2 inches. I was surprised how much I enjoyed it despite the amount of time it took to finish them and I ended up doing one every day of the residency. Here they are with their inspiration. Most of the tapestries were woven at 12 epi on a 6-dent Hokett loom. The warp was mostly cotton seine twine though there is some linen in there and the weft was mostly Weaver's Bazaar 18/2 wool though there are some Harrisville wool singles and some handspun. Day #1: My first full day at the park. I was a bit overwhelmed and spent the day being a tourist--driving to each of the stops and following the little paved trails. 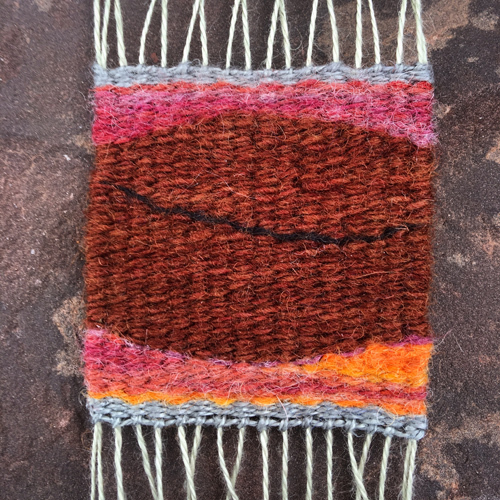 This first weaving was an experiment with yarn and loom as well as a little bit about land and sky. Day #2: This tapestry idea came from my arrival day (Day Zero?). I arrived in a driving rainstorm; unusual, powerful, and much needed in the desert. There was a rainbow just before sunset on my first evening at the park at the conclusion of that storm. I wrote more about this moment HERE. I had to spin the yarn to make this rainbow. I had fleece in rainbow colors, but no other yarn that would do. I did it all in one evening-- the spinning and the weaving (evenings are very long when the sun sets at 5pm). Handspun for the Day #2 rainbow tapestry with my Lark spindle and a potsherd that was at the casita (I did NOT pick it up!). Day #3: This tapestry is about layers. The inspiration for the work actually came from an illustration in a book about the park that showed geology layers. I was thinking a lot about time and how this park represented so much of it. The layers are everywhere. Layers of rock, layers of color in the petrified wood, layers of meaning. This day was Monday, November 7, 2016. Day #4: November 8, 2016. Election day. I hiked and hiked and enjoyed a lot of beautiful petrified wood at Jasper Forest. I wove this in the evening as I started to see the returns and my hope sank with each passing moment. I didn't have wifi or a radio at this point and of course there is no television in the park. So I was watching the returns on my phone and that little window into the outside world led to a very tough night. Day #5: November 9. In my journal I wrote, "Blindsided. Sick. So afraid." I also wrote THIS blog post. The time represented by so many aspects of this national park is staggering. This moment in US history is but one moment... though it is a dangerous moment I believe. This tapestry is one of my favorites. I didn't have any black yarn, so this was a dark blue and purple combination with a hand-painted yarn for the lines. The inspiration was this rock I found in the black forest on a hike from the casita. Day #6: I was thinking about my two little nieces when I wove this piece. I so wanted them to be small when the first female president of the United States was elected. And thinking of all the children who weren't going to get that message--that a woman could hold the most powerful public office in the world. Instead, women are treated like objects by the now president-elect and that is a very sad and dangerous message to give our young people. I did my first bird survey with the park biologist, Andy Bridges on this morning. It was wonderful to be up before sunrise and have a task to do that mostly involved standing still and watching and listening for birds. The header image for this post was sunrise on this day. The antler shed was one Andy found while we were on the survey. Day #7: My parents came to visit the park. I had a lot of fun showing them some of my favorite spots so far and we had a nice lunch my Mom brought along. My Mom loves the dusty purple color that is everywhere in the painted desert. The color of this tapestry isn't it at all, but it is the purple gradation I had along... with glints of orange and yellow from the petrified wood. The first part of my stay was so warm I spent many evenings sitting on the portal spinning or weaving. Rebecca Mezoff. Day #7, "Mars Violet"
Day #8: November 12th. I hiked the back side of Blue Mesa, an amazing formation with striped bands. I followed some footprints looking for the "dying grounds" and came close to finding them (an active fossil dig site so named because so many creature fossils are found there). I did some drawing and then I wove this tapestry in the evening. I needed the rich colors of this handspun yarn. Rebecca Mezoff. Day #8. "A good wander is never a waste." Day #9: Angel's Garden. I started calling my fairly accurate spatial abilities my "hiking superpowers" around this day. There are almost no marked trails in this park and I didn't even have a topo map of the area (couldn't get one though I tried). But turns out there are some great landmarks and as I grew more comfortable locating them, I ventured farther and farther into the painted desert. This day I found Angel's Garden from my knowledge of another landmark (Onyx Bridge) and a point on a sign on the road. There were huge trees there. It is impossible from the photographs to get a sense for the vastness of the landscape and how huge these logs are--probably the ones at Angel's Garden are 6-7 feet in diameter. I wove this tapestry with some hand-painted Harrisville Shetland and bits of silk. It was a beautiful day and I brought Keri Smith's Wander Society book along with my weaving kit. Day #10: I wrote in my journal this morning as I was working on the design for an upcoming commission that I needed to stay away from the news and Facebook for awhile. My desire to remain sane and participate in this residency was at odds with knowledge about the world. Unfortunately, my determination was short lived as I saw a horrible series of articles about the beliefs of the incoming cabinet members, VP-elect Pence, and Trump himself about LGBTQ people. I was compelled to weave this piece. I have had more than one person tell me that they wished I could leave the political out of this series of work. But I will reiterate here that this was a diary. I was weaving what I felt and saw each day and as such, I couldn't leave out the politically charged thoughts of this time. I expect that some of you will stop following my work because of this, but I will ask again that we work toward dialogue instead of denial (which goes both ways!). Rebecca Mezoff. Day #10. Fear and determination. Day #11: I went to Jasper Forest again this day. It is a place where you can head straight off the mesa and explore masses of petrified wood and gorgeous formations for as long as you want to. It was a hard day, but sometimes hard days lead you to lay on your back in the sand and watch clouds for awhile. And that is a good thing to do on any day. As always, Jasper Forest provided beautiful vistas and amazing petrified wood. Everywhere you walk in the desert, there are cracks in the sand. These were endlessly fascinating to me. This tapestry came from those cracks. Rebecca Mezoff. Day #11. Cracks. Day #12: I did my second bird survey with the park biologist this morning. It was one of the most amazing days in the park, and they were all stunning. Andy took me and another self-professed "bird nerd" and paleo intern out to the eastern expansion lands, a place I would not have otherwise been able to go. The morning included a marvelous sunrise, some really fun four-wheeling through endless washes, walking meditation while watching for birds, and a tour of the eastern expansion lands. I saw a burrowing owl near headquarters before dawn, horned larks, house finches, ravens, a red-tailed hawk, and flickers. I had hoped for porcupines as we were down in the bosque, but none were sleeping in the trees this morning. The tapestry I wove was from an earlier photograph at Jasper Forest. It is the erosion lines in the formations. Sunrise across the eastern expansion lands. This image was not altered at all. Day #13: I had an amazing tour of the park collections this morning. I also met another artist-in-residence who had just arrived for two weeks, Amanda Palmer. Matt, the collections curator, showed us some incredible fossils and described some of his work piecing together bits of this and that to reconstruct the animals that lived here hundreds of millions of years ago. He showed us the cabinet of holotypes which was pretty incredible. I hiked out on the painted desert again and wove this piece which is about the amazing layers that exist everywhere here. It was woven with that hand-painted Harrisville Shetland yarn you've seen in other pieces. I spent some time spinning this ombre. I brought a bag of merino roving in various colors and I spent time hand-carding it and then spinning one continuous color-changing length. I have yet to weave it. Day #14: This day I used my hiking superpowers to find the fossil clam beds. The off-the-beaten-path hike description assumes you're using a GPS. I don't have a GPS, but I do have a good ability to follow a map, even when it is very tiny and photocopied. I found them. A huge, spilling tumble of rocks from the top of the mesa, perhaps 3 miles from the car, filled with fossil clams. The funniest thing about that hike was that it crosses the border of the eastern expansion lands which were only acquired by the park a few years ago. There was a barbed wire fence along the old boundary and the park hasn't had time to pull up the posts, but they did immediately remove the wire for the sake of the wildlife. Following the directions and my orienteering toward a distant mesa, I hit the gate in the fence dead on. Only after walking through the cattle gate did I realize that there was no wire in the fence. We do that to ourselves a lot in life, don't we? I found my first pieces of pottery on this hike and was mighty thrilled with that. And the clams were wonderful. I did some sketching back on Blue Mesa and returned home in the dark. The supermoon tapestry, "Waiting for the world to turn". This tapestry came from the supermoon viewing the week before. The title is intended both as an observation and as a political statement. The moon was rising at the same time the sun was setting--shown here in the same tapestry. Fenceposts as far as you can see. Wire gone. Day #15: A marvelous day of petroglyphs. I found a site that a ranger had described to me on an old CCC road (Civilian Conservation Corps did a lot of work in this park in the 30s). Then I visited Martha's Butte and spent some time drawing parts of some fantastic petroglyph panels I found there. I wove this tapestry of a part of one of the Martha's Butte glyphs. I thought it looked very much like a weaving pattern that you might see a Native American weaver produce today. Day #16: This day I did my second demonstration at the Painted Desert Inn. Two students in the Weaving Tapestry on Little Looms online class drove up from Pheonix to visit with me. Thank you Devorah and Christine! It is a 3.5 hour drive each way to Petrified Forest. The set-up and demo took much of the day, but I had one hour before dark and I raced to another spot that Andy had told me about. The site was about a mile from the car and I had to walk fast to get out there and back in an hour with any time to look around. Of course I did go back a couple more times. there was MARVELOUS pottery out there. Rebecca Mezoff. Day #16. The white in this weaving is linen. Day #17: I went back to the site I had visited hurriedly the night before in the morning before a storm hit and the path down became impassible. I marveled further at the potsherds and petroglyphs and I wove this tapestry inspired by the petrified wood there. Day #18: Took a wander with Amanda, the other A-I-R resident and her husband Shaun. Two better people are hard to come by. We found another petroglyph site and then returned to one I had visited earlier. We then found an archaeological site quite by accident and spent a long time photographing potsherds and flakes. Great fun was had by all. This tapestry was inspired by two of the potsherds from the archaeological site. Rebecca Mezoff. Day #18. Pots. Day #19: This days tapestry was inspired by being up high on Blue Mesa at sunset. I was playing with my shadow on the hills. Day #20: Thanksgiving Day. I visited my parents in Gallup where I grew up and wove this tiny pick and pick piece with handspun. Day #21: Back at the park, I hiked to Agate House and then went to find some fossil clams a volunteer told me about. I did find the clams and then wandered about a bit and sat to draw the hoodoos. Rebecca Mezoff. Day #21. This is not a pickle. Some new junior rangers getting sworn in by the endless font of information, Ranger Hallie. She gave me precise directions to those fossil clams right after the swearing in was completed. Day #22: More wandering in the Painted Desert after attending Amanda Palmer's fantasic A-I-R demonstration. I finally found Volunteer John's petroglyphs. Turns out this panel is called the Flatiron... nice to know since I live near Boulder where the foothills of the Rockies are called the Flatirons. I wove this little tapestry after more lovely rock layers found just above the Flatiron panel. Day #23: I went hiking with long-time volunteers, Gary and Connie. It was crazy weather and snowing by the time we got back, but I'd go again if given the chance. We hiked into the painted desert in a big loop. I wove this tapestry called, "Four Friends". Rebecca Mezoff. Day #23. "Four Friends"
Day #24: It snowed overnight and I walked down to the desert early in the morning, afraid the snow would melt quickly. I needn't have worried. I tried to go out hiking later in the day, but the weather was exceptionally nasty. So I spent the afternoon weaving. This tapestry was inspired by some petrified wood I had seen on the hike to Agate House a few days earlier. Day #25: On this day I drove to Flagstaff to pick up Emily who flew in to see the park and for a little post-Thanksgiving family gathering at my parent's house. I stopped at the amazing hotel, La Posada in Winslow to see last year's AIR artwork which was on display there, and made it to Flag in time to meet Emily's tiny plane. We were able to spend a couple wonderful hours with a dear friend in Holbrook before letting ourselves through a couple locked gates and returning to the casita. I wove a reminder of the wonderful casita I stayed in for the month. Day #26: This was Emily's one day to experience the park and I took her to some of my favorite places. It was sunny and beautiful. We visited Martha's Butte, Jasper Forest, the keystone log, Blue Mesa, and saw the sunset from Pintado Point. A wonderful end to my time in the park. I wove this little piece with memories of the brilliant colors and some wedge weave thrown in. Day #27: On this day we cleaned the casita, did the laundry for the next resident, and took one last hike before driving to Gallup. I wove this piece inspired by a favorite potsherd seen on this last day. I can't say enough good things about Kip Woolford and the staff at Petrified Forest National Park. Unending thanks to Kip, Andy, Hallie, Sarah, and Matt for your wealth of information. Further appreciation is due to the volunteers who do a huge amount of work especially in the winter. You were my friends and you told me about so many places I would not have found otherwise: Betsy, Mary, Cindy, John, David, Judy, Gary, and Connie. I was so happy to be able to spend some time with the other artist-in-residence and her husband, Amanda and Shaun. You two cracked me up and were the best adventuring partners. And a huge thanks is due Petrified Forest National Park for hosting such a robust artist-in-residence program. It makes an incredible difference in the lives of the artists who get to come and I know it benefits the park in positive ways also. Below are links to prior posts about my residency.